This article will provide you with a tutorial allowing you to determine how much and where Java heap space is retained from your active application Java threads. A true case study from an Oracle Weblogic 10.0 production environment will be presented in order for you to better understand the analysis process. We will also attempt to demonstrate that excessive garbage collection or Java heap space memory footprint problems are often not caused by true memory leaks but instead due to thread execution patterns and high amount of short lived objects. 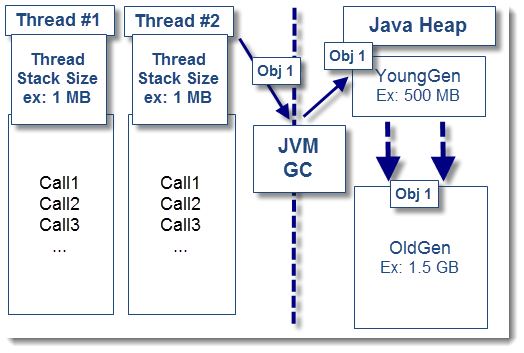 As you may have seen from my past JVM overview article, Java threads are part of the JVM fundamentals. Your Java heap space memory footprint is driven not only by static and long lived objects but also by short lived objects. Finally, you are thinking to either increase the Java heap or look for memory leaks…are you really on the right track? 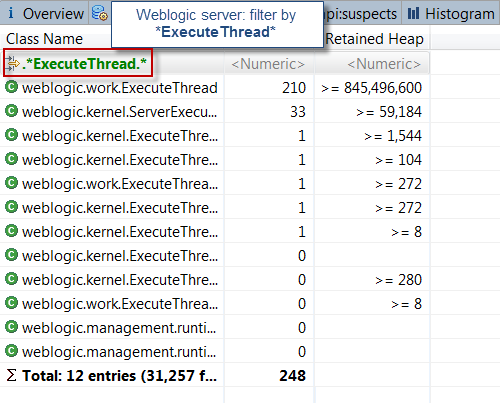 In the above scenario, you need to look at the thread execution patterns and determine how much memory each of them retain at a given time. OK I get the picture but what about the thread stack size? It is very important to avoid any confusion between thread stack size and Java memory retention. The thread stack size is a special memory space used by the JVM to store each method call. When a thread calls method A, it “pushes” the call onto the stack. If method A calls method B, it gets also pushed onto the stack. Once the method execution completes, the call is “popped” off the stack. The Java objects created as a result of such thread method calls are allocated on the Java heap space. Increasing the thread stack size will definitely not have any effect. Tuning of the thread stack size is normally required when dealing with java.lang.stackoverflowerror or OutOfMemoryError: unable to create new native thread problems. The following analysis is based on a true production problem we investigated recently. The team first suspected a memory leak problem from the new code introduced. The first analysis step we did was to perform an analysis of the generated thread dump data. Thread dump will often show you the culprit threads allocating memory on the Java heap. It will also reveal any hogging or stuck thread attempting to send and receive data payload from a remote system. which is more than the configured time of "600" seconds. As you can see, the above thread appears to be STUCK or taking very long time to read and receive the JSON response from the remote server. Once we found that pattern, the next step was to correlate this finding with the JVM heap dump analysis and determine how much memory these stuck threads were taking from the Java heap. Heap dump analysis: retained objects exposed! The Java heap dump analysis was performed using MAT. We will now list the different analysis steps which did allow us to pinpoint the retained memory size and source. As you can see, this view was quite revealing. We can see a total of 210 Weblogic threads created. 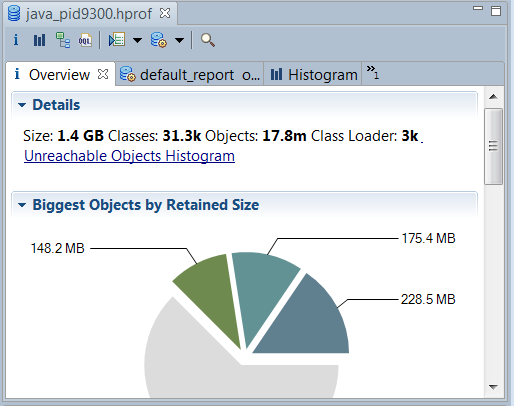 The total retained memory footprint from these threads is 806 MB . This is pretty significant for a 32-bit JVM process with 1 GB OldGen space. This view alone is telling us that the core of the problem and memory retention originates from the threads themselves. The next step was to deep dive into the thread memory retention. To do this, simply right click over the ExecuteThread class and select: List objects > with outgoing references. As you can see, we were able to correlate STUCK threads from the thread dump analysis with high memory retention from the heap dump analysis. The finding was quite surprising. The final analysis step did require us to expand a few thread samples and understand the primary source of memory retention. 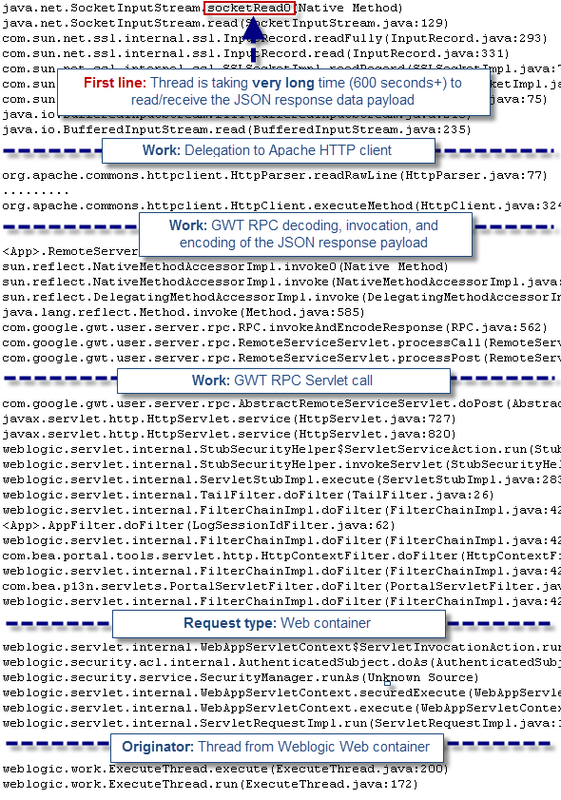 As you can see, this last analysis step did reveal huge JSON response data payload at the root cause. That pattern was also exposed earlier via the thread dump analysis where we found a few threads taking very long time to read & receive the JSON response; a clear symptom of huge data payload footprint. It is crucial to note that short lived objects created via local method variables will show up in the heap dump analysis. However, some of those will only be visible from their parent threads since they are not referenced by other objects, like in this case. You will also need to analyze the thread stack trace in order to identify the true caller, followed by a code review to confirm the root cause. Following this finding, our delivery team was able to determine that the recent JSON faulty code changes were generating, under some scenarios, huge JSON data payload up to 45 MB+. Given the fact that this environment is using a 32-bit JVM with only 1 GB of OldGen space, you can understand that only a few threads were enough to trigger severe performance degradation. This case study is clearly showing the importance of proper capacity planning and Java heap analysis, including the memory retained from your active application & Java EE container threads. 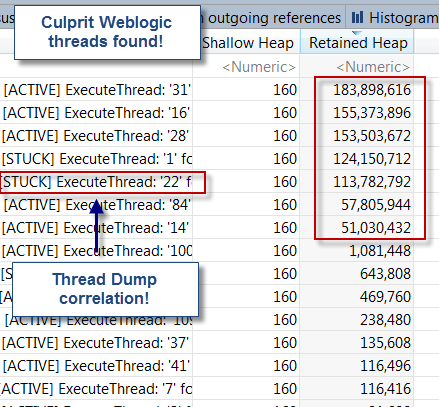 I hope this article has helped you understand how you can pinpoint the Java heap memory footprint retained by your active threads by combining thread dump and heap dump analysis. Now, this article will remain just words if you don’t experiment so I highly recommend that you take some time to learn this analysis process yourself for your application(s).